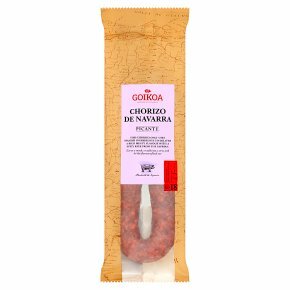 This chorizo only uses Spanish ingredients to deliver a rich meaty flavour with a spicy kick from the paprika Have one to hand when you are cooking to bring out the rich spicy Paprika to add colour or spice to a dish. For a tapas style quick meal, use in an omelette or salad, or just eat it on its own! Warning: White salt crystals may form on the surface of the product.<br>These are naturally occurring and are not detrimental to quality.